Beirut (AFP) - Kurdish fighters seized a strategic Islamic State stronghold in Syria Friday in a move that could impede jihadist movements near the border with Iraq, where they also control large swathes of territory. Meanwhile, the United States and Turkey are to begin training and equipping moderate Syrian rebels for the fight against President Bashar al-Assad and IS. 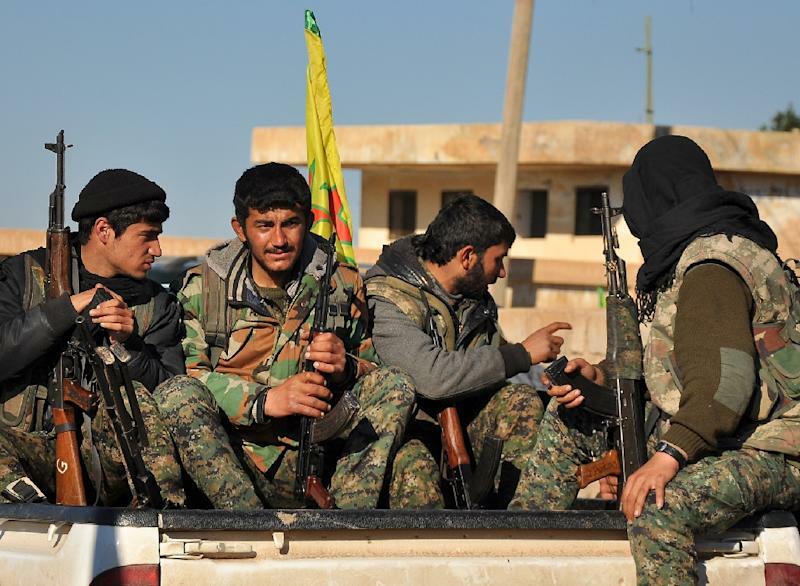 The main Kurdish Democratic Union Party (PYD) said its fighters had liberated Tal Hamis and surrounding communities at the request of residents "who wanted to get rid of these terrorists and mercenaries". The Syrian Observatory for Human Rights said "the jihadists retreated without much resistance after Kurdish forces, backed by Arab fighters, returned to Tal Hamis." The Kurds now occupy a strip of land linking the Hasakeh provincial town, which has been under IS control for more than a year, with the Iraqi border. Observatory director Rami Abdel Rahman said it was "one of the most important strongholds" of the group in the region. The Kurdish advance comes after days of fighting in which YPG forces have taken some 103 villages and hamlets. Since the clashes began last Saturday, at least 175 IS fighters have been killed by the Kurds and in air strikes by a US-led coalition. Additionally, 30 fighters from the YPG and Arab units fighting alongside them have been killed. Among the dead was an Australian, the first Westerner to die in a Kurdish unit in Syria. The Pentagon said the coalition had carried out several air strikes in Hasakeh province on Thursday, including three near Tal Hamis. The fighting came as Kurdish forces continued to battle IS after an offensive elsewhere in the province in which the jihadists kidnapped at least 220 Assyrian Christians. 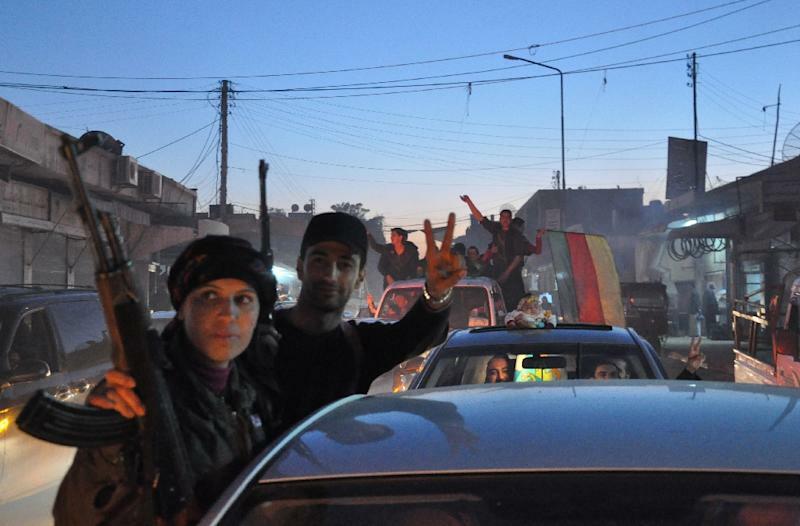 The offensive, during which IS also seized 10 villages, has prompted a mass exodus of an estimated 5,000 people to the cities of Qamishli and Hasakeh. Jean Tolo, an official with the Assyrian Organisation for Relief and Development in Qamishli, said the pace of arrivals had slowed by Friday. "We are offering the displaced food and everything they need," he told AFP by telephone. "There are doctors working for free ready to deal with any emergency," he added. Assyrians number about 30,000 among Syria's 1.2 million Christians and mostly live along the Khabur River in Hasakeh. More than 210,00 people have been killed in Syria since the conflict began in March 2011. Meanwhile, an official in Ankara said Turkey and the United States will begin preparing moderate Syrian rebels for combat. Turkey, an outspoken critic of Assad, hopes they will battle the Damascus regime as well as insurgents from IS, whose territorial gains run right up to the Turkish border. Washington hopes the first forces will be operational by the end of the year, with the goal to train more than 5,000 Syrians in the first year and a total of 15,000 over three years. US intelligence chief James Clapper said Thursday that Turkey did not place a high priority on fighting IS and that foreign fighters had been able to travel through the country into Syria. But Turkish officials insist they have done all they can to tighten border security. Meanwhile, Britain and France said Assad cannot credibly be part of any future government combating the IS threat. "We need a partner in Syria to work with against the extremists and this means a political settlement agreed between the Syrian parties leading to a unity government in Syria," British Foreign Secretary Philip Hammond and his French counterpart Laurent Fabius write in a joint editorial in Le Monde and Al-Hayat newspapers. "It is clear to us that Assad could not credibly be part of any such administration."